Taking a cold hard look at ones own work is like swallowing a bitter pill, but like that pill, self-criticism is necessary for artistic growth and improvement. The trouble is, it’s not so easy to do, and many of us, even though we sat through hours of critiques in art school, don’t have a firm grasp on how to go about doing it, i.e., analyzing our own art. However we must as many of us illustrators work by ourselves and lack the ability to get an impromptu outside opinion when we need it. Based on the article Artistic Criticism: 1. A Synopsis Of Self-Criticism, I intend to apply an analytical methodology to one of the illustrations I produced for a former post, in this case Writing An Elevator Speech. I will self-critique the illustration by analyzing its process, form, content, and context. I will rework the illustration in an attempt to improve it. So here’s the method I will use. I’ll start by stating my intention for each of the four categories. In other words, what my idea or rational was. Then I’ll swallow that bitter pill by observing whether I accomplished my intention or not. Stating what could be done to improve the image, I will then set about reworking the illustration by following the suggestions put forth in the analysis sections. From this self-critique, I hope to improve the illustration in all four areas. The final revised version will be shown along with the original. The intention was to execute an illustration digitally in Adobe Illustrator relying on vector techniques to provide accuracy and uniformity of form while simulating reflective materials. Effects in Illustrator provided a reasonable means to create a metallic surface and plastic forms. The flat surface panel gradients appear over constructed. There is an error in in the layer positioning of the reflected highlight on the elevator buttons. 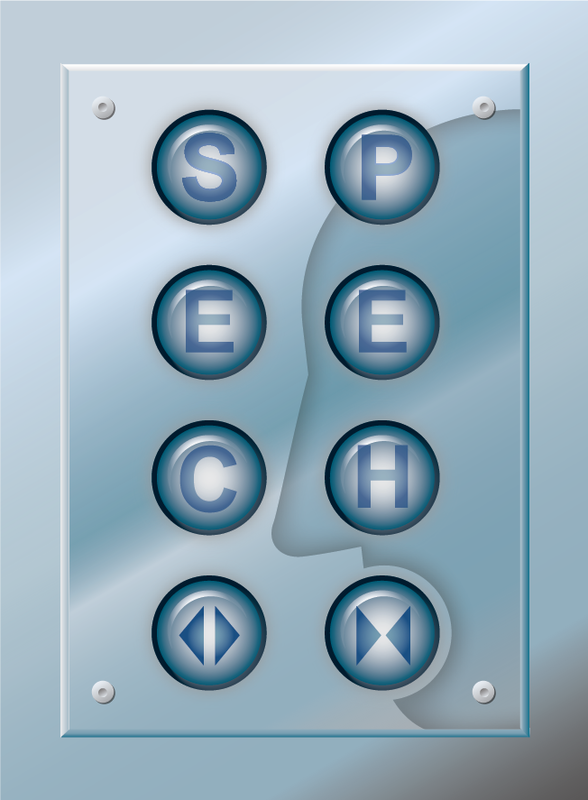 Produce a stylized design of an elevator panel with a reflection appearing of a face that is speaking. The color and surface is meant to suggest metal and plastic materials. The image is meant to be an iconographic object rather than a scene or environment. The scheme is primarily monochromatic to reflect the local color of the materials. Interest wise it could benefit from more color variety, even pseudo color. Color may offer the greatest opportunity for improving the attractiveness of the image. The main compositional element is the panel with the variable element of the face, which is positioned relative to the panel buttons. There could be an improved relationship of elements if the face were altered to align more naturally with the panel and buttons. The proportion and scale of elements is determined by their relationship and readability on a webpage. Elements may be excessively oversized for their function. Scale changes may improve the anatomical relationship of the face to the elevator buttons. Adjustment of some of the rendering effects could improve the suggested dimensionality in the image. The iconic forms lack the suggestion of perspective, which if applied to the face or panel could provide more visual interest and reinforce the suggestion of a real object or setting. 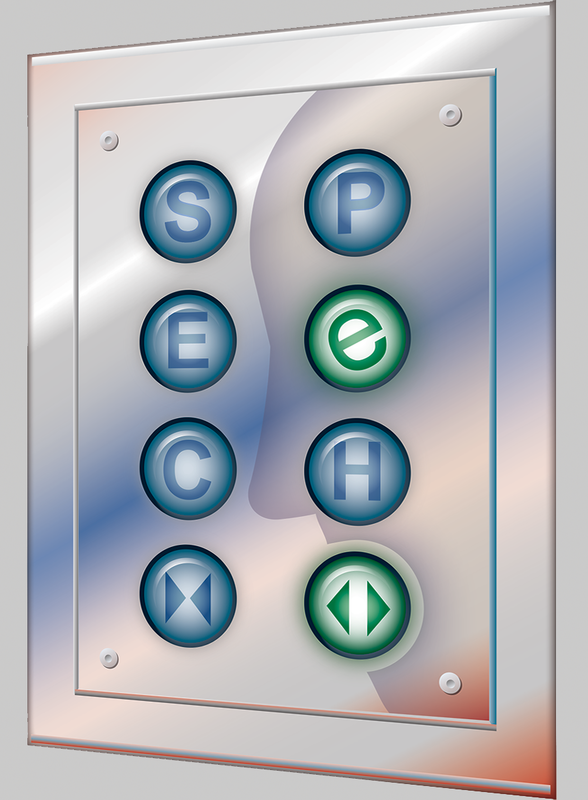 The basic concept of the illustration is to suggest a speech occurring in an elevator by creating an iconic form integrating the word speech in an elevator panel containing the reflection of a face. Elements of the elevator panel are to align with the face form to suggest insight. There are errors in the illustration that affect the narrative being communicated. 1) The button that is surrounded by the mouth is the “close doors” symbol. This metaphorically suggests that the speech is closing doors rather than opening them. 2) None of the buttons are lit up. This suggests that the speech is taking it’s speaker nowhere, a distinct lack of implied action. 3) The two “E” elevator buttons appear to be the same floor. There should be a difference between the two. Aligning an elevator button to the position of an eye on the face would bring life to the concept. Correcting these content issues will clarify the storyline and add some visual interest as well. The illustration will appear as a partial-page illustration, inset in a web article. The background color of the site is a warm grey. The image should be quickly identifiable and draw interest to the article subject while drawing a viewers interest. The new revised image must come before the original in order to be the indexing image on Google and social network sites. Although the overall cool blue-grey differs from the background in hue, it is similar in value and chroma resulting in a loss of contrast. Additional contrast and alternative color additions would increase visibility. The odd conspicuous nature of perspective would aid in distinguishing the illustration from its setting within the page layout. Revised illustration. © 2014 Don Arday. Original illustration. © 2014 Don Arday.